In my previous post I wrote about what OnHerCam 2.0 has to offer for cam models. On related note OHC was kind enough to offer this FREE web cam contest to the readers of iCamModel. This contest is great for those who are looking to become cam model or for those who already work and are not happy with their networks. Create 2 minutes video review about your experience with OHC. Please note that this contest is based on “First-come, first-served” basis. There is only one web cam to be given away so the first model who qualifies will get it. But it doesn’t mean that you can’t join OHC network if you happen to be late. As I mentioned before OHC focuses on quality rather than quantity in terms of models they hire. To be accepted to their network you have to be attractive, be fluent in English and preferably live in US, UK or Australia. Also note that OHC has no problem with you working on other networks as long as you stay active on their network. So if you feel like you qualify for this contest register with OHC network and then let me know so that I know you are part of the contest. I will also make sure that your application is processed promptly. Click here to contact me. 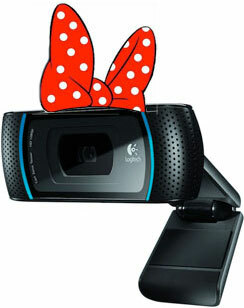 Logitech C910 webcam is becoming very popular among cam models. It supports high definition video recording and calling which will let you perform high quality cam shows. So hurry up to claim your FREE Logitech C910 webcam. Hey, has anyone taken up this contest yet? Well, I’m an aspiring cam model and I haven’t chosen a site. Everything you said about OnHerCam sounds great! I bet they treat their models really well and since they have all English speakers, I would fit in! I really feel that I have something to offer a cam site since I can relate to members on a deeper level and talk about anything.